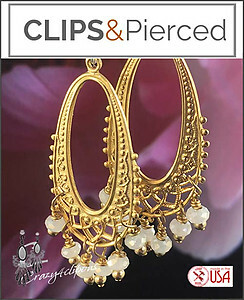 Features: Feel sophisticated when donning an intricate pair of chandelier earrings. 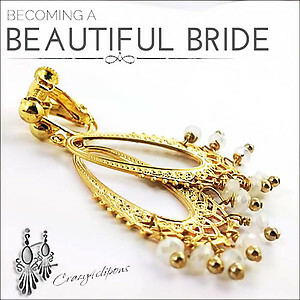 These gorgeous golden earrings are an exquisite example of chic style with subdued adornments and in a lovely design. The gorgeous open style oval features hand wrapped cloudy faceted crystals stones. Gold Plated, the matte white colors of the stones stand out against the golden luster of the setting. Feel glamorous and wear these earrings during day or night-time.